Bluemay policy is to get the right goods to the customer at the place and time the customer specifies. Our quality systems cover the manufacture of the correct product on time, while for deliveries we use contract carriers to deliver either individual boxes or pallet consignments directly to customers. If an order for a standard ex stock item is received before 3.30 pm on a working day, our aim is to despatch it that same afternoon by courier for next day delivery. 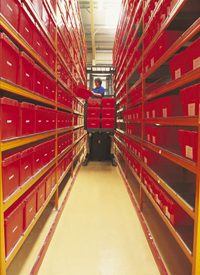 Orders for forward despatch are scheduled into our computer systems for picking and packing up to three days prior to the actual date of despatch. We are very familiar with KANBAN and JIT systems. Call our Sales Team on 01380 821811 to discuss the projected delivery date for your enquiry.